It would not seem like a du Maurier World Stage Festival without a new work by Canada’s best-known theatre artist, Robert Lepage. This year we have the English-language première of “The Far Side of the Moon”, known until shortly before it opened as “The 12th House”. The new title more accurately reflects the French title, “La Face cachée de la lune”, as it appeared in its world première at Le Théâtre du Trident in Quebec City on February 29, 1999. The play was co-written by Adam Nashman and based on an original concept by the Swedish producer, Peder Bjurman. American performer, Laurie Anderson, wrote and recorded the original score. The advance publicity made one think the play was Lepage’s meditation on man’s dream of travelling to the moon. In fact, the play is much more earthbound, focussing on the relation of two brothers, Philippe and his younger brother André, who grew up against the backdrop of the US-Soviet space race. (Philippe gives his birthdate as December 12, 1957, the same as Lepage’s.) Philippe, now 42, is defending his thesis on Konstantin Tsiolkovsky (1857-1935), the first theoretician of space flight and the first to formulate escape velocity. André, 38, is a weatherman for the Weather Channel and thus is constantly gesturing over satellite photos of weather patterns on earth. This is the only literal outer space connection between them. Metaphorically, however, they are like two sides of the moon--André, highly visible in his TV job and facing only the earth in his limited concerns, Philippe, almost totally unknown but facing the rest of the universe in his aspirations. They are also like the two sides in the space race during which they grew up. André, interested only in appearances and money, is like the Americans astronauts who reach their goal of being first on the moon because of financing and narcissism (as per Lepage’s definition of “astronaut”). Philippe, full of ideas but unsuccessful, is like the Soviet cosmonauts who (according to Lepage) thought of reaching the moon in the much larger context of exploring the cosmos, i.e. exploring “what is”. Philippe’s two heroes, Tsiolokovsky and the cosmonaut, Alexei Leonov, were both creative artists as well as scientists. They combine in themselves the two qualities, the visionary and the practical, that led to man’s landing on the moon. The action of the play takes us through several weeks in the lives of the two brothers, primarily Philippe, shortly following the death of their mother. He, not André, is the one interested in cleaning out their mother’s apartment. He is one who makes increasingly more unsuccessful attempts to communicate his ideas: first at his thesis defense, then failing to meet the Alexei Leonov in Quebec City, and worst, flying to Moscow to address a conference on Tsiolkovsky, only to miss the meeting because of the time change. Early in the play, Philippe learns of a competition by the scientific group SETI (Search for Extraterrestrial Intelligence) to select ten home-made videos later to be beamed into outer space to give any listening extraterrestrials a view of life on earth. Interspersed throughout the play, before his disastrous trip to Moscow, we see Philippe making parts of the video. The final irony in the plot is that, although Philippe has been a “loser” in every way, his video is chosen as one of the ten to represent life on earth. As the ending shows, this work, in contrast with much of Lepage’s other work, is a comedy. Not only is the arc of the plot comic, but there is abundant humour throughout. Philippe’s video shoots of life of earth brings his, and Lepage’s, satirical eye to bear on everything we take for granted. The satirical point of view is always that of the outsider or one who feels “other” in relation to his surroundings. While we laugh with Philippe as he points out the absurdity of everyday objects and rituals, we laugh at André for his self-importance and lack of self-knowledge. Besides this, much humour throughout the work derives from Lepage’s fundamental sense of “play”. It is this aspect for which Lepage is best known, but here more than his other work we are meant to enjoy the vitality of the imagination that can transform the ordinary into the extraordinary. As a result the set (co-designed by Marie-Claude Pelletier) is relatively simple compared to the complex cubicles of “The Seven Streams of the River Ota” or the various mechanisms concealed beneath the gravel floor in “The Geometry of Miracles”. The most complex set element is a mechanical wall the width of the stage--mirrored on one side, dark with fluorescent lights on the other--that can rise or turn either side parallel to the floor. This wall embodies the central metaphor of the play, the moon, reflecting us (literally us the audience) on one side and dark on the other. Behind this wall is another wall made of sliding panels that can become rooms or doors to rooms, closets or elevators depending on how they are opened or closed. Lepage is also known for his use of various kinds of media. In this work we find puppets of astronauts (designed by Pierre Robitaille and Sylvie Courbron, manipulated by Marco Poulin), live video, projections and documentary films about the space race that serve as interludes between scenes. Nevertheless, the greatest and most humorous effects are achieved by far simpler means. An ironing board becomes in Lepage’s hands various pieces of gym equipment, a moped, a CAT-scan table, a lunar rover or even himself as a child. The door to a washing machine becomes the hatch of a space capsule, a CAT-scan machine, the womb, an airplane window or a goldfish bowl. Indeed, this work made me wonder whether Lepage is in the process of divesting his theatre of its high-tech trappings in favour of something purer and simpler. In this physical environment where anything can change into anything else, it is fitting that Lepage himself play all the parts. He plays not only the two brothers, but their mother, Alexei Leonov, an American astronaut and Philippe’s doctor. Lepage makes the last three of these very distinct in terms of accent and diction (the mother is silent), but strangely, he has both brothers speak in exactly the same low-voltage, deadpan manner. Only through the witty costuming (by Marie-Chantal Vaillancourt) and by what they say can one tell the two apart. More striking than his acting is Lepage’s ability at mime. There are occasions through the play when no props at all are used. His miming is so precise that we know, for example, what all the various objects are when André rummages through his brother’s side of the bedroom. 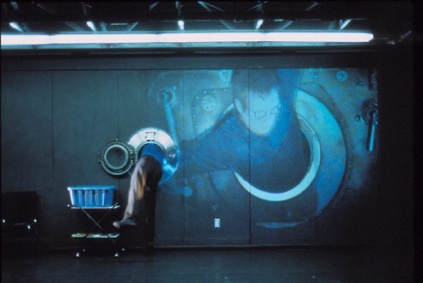 The highpoint of mime in the play is also the play’s final scene when Philippe performs a delightful zero-gravity ballet to Beethoven’s “Moonlight Sonata” in an airport waiting room. The structure of the work is quite unusual in that Lepage never plays more than one character in a scene. As a result, each character is seen only when addressing an unseen listener. We see this in the numerous one-sided telephone calls through the play, Philippe’s voice-overs as he makes videos for a potential alien audience, the doctor’s speaking to his unseen patient, Philippe complaining to an unseen bartender or when Philippe decides to give a speech anyway to a room of empty chairs set for the meeting he has missed. The structure of seen speaker and unseen listener, of course, parallels the visual theme of the seen and unseen sides of the moon. We use our imagination to extrapolate from the one side we see or hear what the other side must be. This play of multiple binary oppositions is meant to lead us to an overriding unified view. We may be surprised, but should not be, that the play, which shows us the famous 1975 Apollo-Soyuz handshake in space, ultimately leads to the reconciliation of two brothers who, according to their mother, had built a “Berlin Wall” between them. That wall, a central image in Lepage’s 1988 “Le Polygraph”, is down now. In a play in which one actor can become several characters and any object can apparently change into any other, Lepage seems to be asking us to see that there is no border between what we know and what we can imagine. He was greeted at the end with thunderous applause. Photos: Robert Lepage. ©2000 Emmanuel Valette.